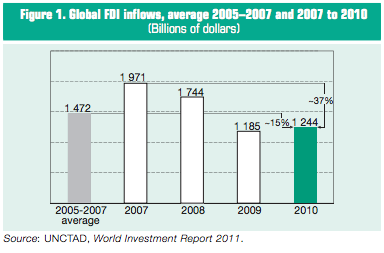 Global foreign direct investment (FDI) inflows rose modestly by 5 per cent, to reach $1.24 trillion in 2010. While global industrial output and world trade are already back to their pre-crisis levels, FDI flows in 2010 remained some 15 per cent below their pre-crisis average, and nearly 37 per cent below their 2007 peak (figure 1). 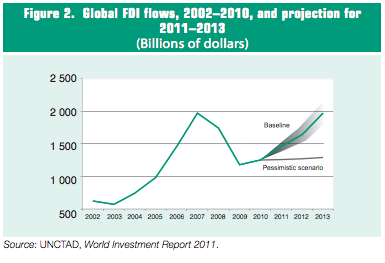 UNCTAD predicts FDI flows will continue their recovery to reach $1.4–1.6 trillion, or the pre-crisis level, in 2011. They are expected to rise further to $1.7 trillion in 2012 and reach $1.9 trillion in 2013, the peak achieved in 2007 (figure 2). The record cash holdings of TNCs, ongoing corporate and industrial restructuring, rising stock market valuations and gradual exits by States from financial and non-financial firms’ shareholdings, built up as supporting measures during the crisis, are creating new investment opportunities for companies across the globe. widespread sovereign debt crisis and fiscal and financial sector imbalances in some developed countries, as well as rising inflation and signs of overheating in major emerging market economies, may yet derail the FDI recovery. Developing economies increased further in importance in 2010, both as recipients of FDI and as outward investors. As international production and, recently, international consumption shift to developing and transition economies, TNCs are increasingly investing in both efficiency- and market-seeking projects in those countries. 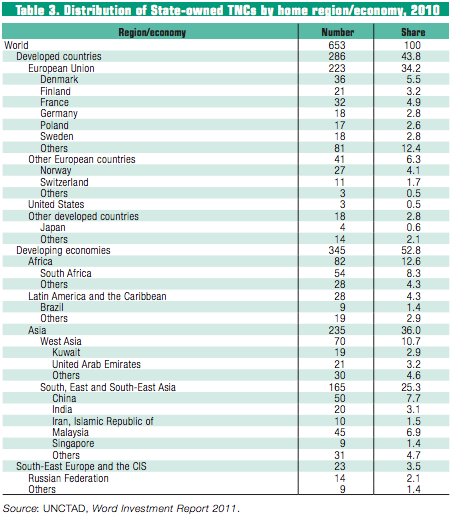 For the first time, they absorbed more than half of global FDI inflows in 2010 (table 1). Half of the top-20 host economies for FDI in 2010 were developing or transition economies. FDI outflows from developing and transition economies also increased strongly, by 21 per cent. They now account for 29 per cent of global FDI outflows. In 2010, six developing and transition economies were among the top-20 investors. The dynamism of emerging-market TNCs contrasts with the subdued pace of investment from developed-country TNCs, especially those from Europe. Their outward investment was still only about half of their 2007 peak. Sectoral patterns. The moderate recovery of FDI inflows in 2010 masks major sectoral differences. FDI in services, which accounted for the bulk of the decline in FDI flows due to the crisis, continued on its downward path in 2010. All the main service industries (business services, finance, transport and communications and utilities) fell, although at different speeds. FDI flows in the financial industry experienced one of the sharpest declines. The share of manufacturing rose to almost half of all FDI projects. Within manufacturing, however, investments fell in business-cycle-sensitive industries such as metal and electronics. The chemical industry (including pharmaceuticals) remained resilient through the crisis, while industries such as food, beverages and tobacco, textiles and garments, and automobiles, recovered in 2010. FDI in extractive industries (which did not suffer during the crisis) declined in 2010. Modes of entry. The value of cross-border M&A deals increased by 36 per cent in 2010, but was still only around one-third of the previous peak in 2007. The value of cross-border M&As into developing economies doubled. Greenfield investments declined in 2010, but registered a significant rise in both value and number during the first five months of 2011. Components of FDI. Improved economic performance in many parts of the world and increased profits of foreign affiliates lifted reinvested earnings to nearly double their 2009 level. The other two FDI components – equity investment flows and intra-company loans – fell in 2010. Special funds. Private equity-sponsored FDI started to recover in 2010 and was directed increasingly towards developing and transition economies. However, it was still more than 70 per cent below the peak year of 2007. FDI by sovereign wealth funds (SWFs) dropped to $10 billion in 2010, down from $26.5 billion in 2009. A more benign global economic environment may lead to increased FDI from these special funds in 2011. 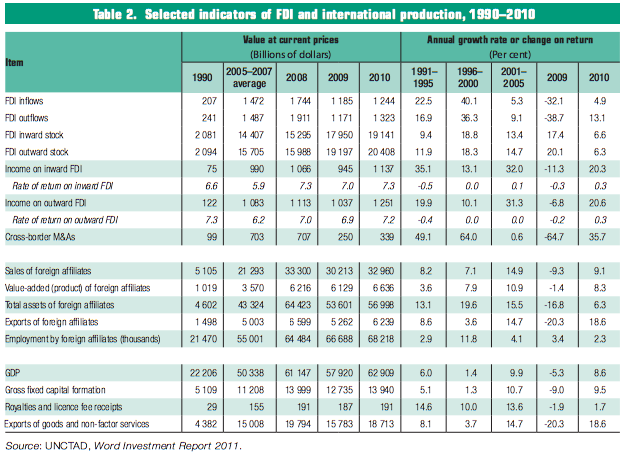 Indicators of international production, including foreign sales, employment and assets of TNCs, showed gains in 2010 as economic conditions improved (table 2). UNCTAD estimates that sales and value added of foreign affiliates in the world reached $33 trillion and $7 trillion, respectively. They also exported more than $6 trillion, about one-third of global exports. TNCs worldwide, in their operations both at home and abroad, generated value added of approximately $16 trillion in 2010 – about a quarter of total world GDP. State-owned TNCs are causing concerns in a number of host countries regarding national security, the level playing field for competing firms, and governance and transparency. From the perspective of home countries, there are concerns regarding the openness to investment from their State-owned TNCs. Discussions are underway in some international forums with a view to addressing these issues. Today there are at least 650 State-owned TNCs, constituting an important emerging source of FDI (table 3). Their more than 8,500 foreign affiliates are spread across the globe, bringing them in contact with a large number of host economies. While relatively small in number (less than 1 per cent of all TNCs), their FDI is substantial, reaching roughly 11 per cent of global FDI flows in 2010. Reflecting this, Stateowned TNCs made up 19 of the world’s 100 largest TNCs. State-owned TNCs constitute a varied group. Developing and transition economies are home to more than half of these firms (56 per cent), though developed countries continue to maintain a significant number of State-owned TNCs. In contrast to the general view of State-owned TNCs as largely concentrated in the primary sector, they are diversified and have a strong presence in the services sector. The rise of FDI to developing countries masks significant regional differences. Some of the poorest regions continued to see declines in FDI flows. Flows to Africa, least developed countries (LDCs), landlocked developing countries (LLDCs) and small island developing States (SIDS) continued to fall, as did those to South Asia. At the same time, major emerging regions, such as East and South-East Asia and Latin America, experienced strong growth in FDI inflows (table 1). FDI flows to Africa fell by 9 per cent in 2010. At $55 billon, the share of Africa in total global FDI inflows was 4.4 per cent in 2010, down from 5.1 per cent in 2009 (table 1). FDI to the primary sector, especially in the oil industry, continued to dominate FDI flows to the continent. It accounted for the rise of Ghana as a major host country, as well as for the declines of inflows to Angola and Nigeria. Although the continuing pursuit of natural resources, in particular by Asian TNCs, is likely to sustain FDI flows to sub-Saharan Africa, political uncertainty in North Africa is likely to make 2011 another challenging year for the continent as a whole. Although there is some evidence that intraregional FDI is beginning to emerge in non-natural resource related industries, intraregional FDI flows in Africa are still limited in terms of volume and industry diversity. Harmonization of Africa’s regional trade agreements and inclusion of FDI regimes could help Africa achieve more of its intraregional FDI potential. Inflows to East Asia, South-East Asia and South Asia as a whole rose by 24 per cent in 2010, reaching $300 billion. However, the three subregions experienced very different trends: inflows to ASEAN more than doubled; those to East Asia saw a 17 per cent rise; FDI to South Asia declined by one-fourth. Inflows to China, the largest recipient of FDI in the developing world, climbed by 11 per cent, to $106 billion. With continuously rising wages and production costs, however, offshoring of labour-intensive manufacturing to the country has slowed down, and FDI inflows continue to shift towards high-tech industries and services. In contrast, some ASEAN member States, such as Indonesia and Viet Nam, have gained ground as low-cost production locations, especially for low-end manufacturing. The decline of FDI to South Asia reflects a 31 per cent slide in inflows to India and a 14 per cent drop in Pakistan. In India, the setback in attracting FDI was partly due to macroeconomic concerns. At the same time, inflows to Bangladesh, an increasingly important low-cost production location in South Asia, jumped by 30 per cent to $913 million. FDI outflows from South, East and South-East Asia grew by 20 per cent to about $232 billion in 2010. In recent years, rising FDI outflows from developing Asia demonstrate new and diversified industrial patterns. In extractive industries, new investors have emerged, including conglomerates such as CITIC (China) and Reliance Group (India), and sovereign wealth funds, such as China Investment Corporation and Temasek Holdings (Singapore). Metal companies in the region have been particularly active in ensuring access to overseas mineral assets, such as iron ore and copper. In manufacturing, Asian companies have been actively taking over large companies in the developed world, but face increasing political obstacles. FDI outflows in the services sector have declined, but M&As in such industries as telecommunications have been increasing. FDI flows to West Asia in 2010 continued to be affected by the global economic crisis, falling by 12 per cent, but they are expected to bottom out in 2011. However, concerns about political instability in the region are likely to dampen the recovery. FDI outflows from West Asia dropped by 51 per cent in 2010. Outward investment from West Asia is mainly driven by government-controlled entities, which have been redirecting some of their national oil surpluses to support their home economies. The economic diversification policies of these countries has been pursued through a dual strategy: investing in other Arab countries to bolster their small domestic economies; and also investing in developed countries to seek strategic assets for the development and diversification of the industrial capabilities back at home. Increasingly this policy has been pursued with a view to creating productive capabilities that are missing at home, such as motor vehicles, alternative energies, electronics and aerospace. This approach differs from that of other countries, which have generally sought to develop a certain level of capacity at home, before engaging in outward direct investment. 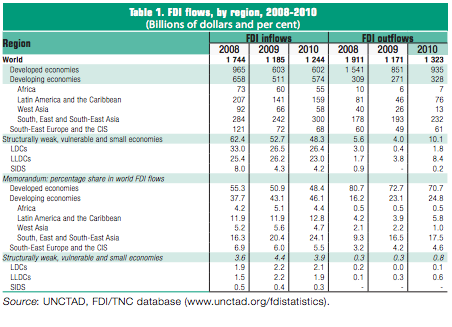 FDI flows to Latin America and the Caribbean increased by 13 per cent in 2010. The strongest increase was registered in South America, where the growth rate was 56 per cent, with Brazil particularly buoyant. FDI outflows from Latin America and the Caribbean increased by 67 per cent in 2010, mostly due to large crossborder M&A purchases by Brazilian and Mexican TNCs. FDI flows to transition economies declined slightly in 2010. Flows to the Commonwealth of Independent States (CIS) rose marginally by 0.4 per cent. Foreign investors continue to be attracted to the fast-growing local consumer market, especially in the Russian Federation where flows rose by 13 per cent to $41 billion. In contrast, FDI flows to South-East Europe dropped sharply for the third consecutive year, due partly to sluggish investment from EU countries. South–East interregional FDI is growing rapidly. TNCs based in transition economies and in developing economies have increasingly ventured into each other’s markets. For example, the share of developing host countries in greenfield investment projects by TNCs from transition economies rose to 60 per cent in 2010 (up from only 28 per cent in 2004), while developing-country outward FDI in transition economies increased more than five times over the past decade. Kazakhstan and the Russian Federation are the most important targets of developing-country investors, whereas China and Turkey are the most popular destinations for FDI from transition economies. Such South–East interregional FDI has benefited from outward FDI support from governments through, among others, regional cooperation (e.g. the Shanghai Cooperation Organization) and bilateral partnerships. In contrast to the FDI boom in developing countries as a whole, FDI inflows to the 48 LDCs declined overall by a further 0.6 per cent in 2010 – a matter of grave concern. The distribution of FDI flows among LDCs also remains highly uneven, with over 80 per cent of LDC FDI flows going to resource-rich economies in Africa. However, this picture is distorted by the highly capital-intensive nature of resource projects. Some 40 per cent of investments, by number, were in the form of greenfield projects in the manufacturing sector and 16 per cent in services. On the occasion of the 2011 Fourth United Nations Conference on the Least Developed Countries, UNCTAD proposed a plan of action for investment in LDCs. The emphasis is on an integrated policy approach to investment, technical capacity-building and enterprise development, with five areas of action: publicprivate infrastructure development; aid for productive capacity; building on LDC investment opportunities; local business development and access to finance; and regulatory and institutional reform. Landlocked developing countries (LLDCs) saw their FDI inflows fall by 12 per cent to $23 billion in 2010. These countries are traditionally marginal FDI destinations, and they accounted for only 4 per cent of total FDI flows to the developing world. With intensified South–South economic cooperation and increasing capital flows from emerging markets, prospects for FDI flows to the group may improve. FDI inflows to small island developing States (SIDS) as a whole declined slightly by 1 per cent in 2010, to $4.2 billion. As these countries are particularly vulnerable to the effects of climate change, SIDS are looking to attract investment from TNCs that can make a contribution to climate change adaptation, by mobilizing financial and technological resources, implementing adaptation initiatives, and enhancing local adaptive capacities. In 2010, FDI inflows in developed countries declined marginally. The pattern of FDI inflows was uneven among subregions. Europe suffered a sharp fall. Declining FDI flows were also registered in Japan. A gloomier economic outlook, austerity measures and possible sovereign debt crisis, as well as regulatory concerns, were among the factors hampering the recovery of FDI flows. Inflows to the United States, however, showed a strong turnaround, with an increase of more than 40 per cent. In developed countries, the restructuring of the banking industry, driven by regulatory authorities, has resulted in a series of significant divestments of foreign assets. At the same time, it has also generated new FDI as assets changed hands among major players. The global efforts towards the reform of the financial system and the exit strategy of governments are likely to have a large bearing on FDI flows in the financial industry in coming years. The downward trend in outward FDI from developed countries reversed, with a 10 per cent increase over 2009. However, this took it to only half the level of its 2007 peak. The reversal was largely due to higher M&A values, facilitated by stronger balance sheets of TNCs and historic low rates of debt financing.